Treatment and prognosis depends on the type of hair loss, says Dr Louise Newson. Alopecia describes any type of hair loss. There are various patterns of alopecia with a variety of causes but it is often idiopathic. The three stages of the hair cycle are anagen (growth phase), catagen (short transition stage) and telogen (resting phase). Anagen on the scalp lasts between three and five years and hair grows at around 1cm per month. The duration of the anagen phase varies between people and it determines how long hair will grow if not cut. The catagen phase is an involutional stage that lasts around two weeks and the telogen phase lasts about three months. The hair remains in the follicle but does not grow. At the end of the telogen phase the follicle starts production of new anagen hair, which displaces the old hair from the follicle. Alopecia areata is a non-scarring alopecia where there are small areas of hair loss, mainly on the scalp. The patch of scalp is smooth centrally, and the normal follicular orifices can be seen. At the periphery, the hair may be short and 'exclamation mark' hairs may be present, where a hair of less than 1cm reduces in bore and pigment towards the scalp surface. Although these are pathognomonic they are variable. Alopecia areata occurs in 0.1-0.2 per cent of people with a peak incidence between 15 and 30 years of age. Patients with alopecia areata have a higher incidence of other autoimmune disorders. Although most patients with alopecia areata have a single lesion, some can have multiple lesions. Nail changes can occur in around 10 per cent of patients, including pitting, onycholysis, koilonychia and leukonychia. Hair may also be lost at other body sites. Alopecia totalis is when all scalp hair is lost. Alopecia universalis is if all body hair is lost. In patients with a small number of patches of hair loss, spontaneous recovery within a year occurs in 30-80 per cent. The prognosis for more extensive lesions affecting at least 50 per cent of the scalp, including alopecia totalis, is less favourable. Treatments that may be used by a specialist include potent topical steroids and intradermal injection of triamcinolone acetonide to limited areas. Topical immunotherapy using diphencyprone is sometimes given. This provokes a titrated allergic response in areas of affected scalp. Although hair regrowth occurs in around 50 per cent of subjects, this may not be sustained. Minoxidil can be helpful in extensive alopecia areata but not alopecia totalis or alopecia universalis. In more severely affected patients, wigs and hair pieces are often used. The current recommendations suggest referring patients under 16 and those where hair loss exceeds 50 per cent of the scalp for a specialist opinion. Androgenetic alopecia is male pattern baldness. It has a strong familial trait and becomes more common with advancing age. Women can also be affected by androgenetic alopecia, particularly after the menopause when there are fewer estrogens to counteract the androgens. Women with male pattern baldness should have their testosterone and dehydroepiandrosterone levels measured. There are two treatments available but only as private prescriptions. Minoxidil solution takes months before improvement may be seen and should be discontinued if there is no improvement after a year. It is successful in only 15 per cent of cases. Oral finasteride (1mg daily) increases hair count and improves hair appearance.3 However, it may be up to six months before benefit is seen and any benefit reverts on cessation of treatment. The antiandrogen cyproterone may be beneficial for some women. Telogen effluvium typically occurs six to 12 weeks after a physiological or hormonal stress triggers hairs to move into telogen phase. When new hairs appear in anagen phase they push out the telogen hairs. Acute febrile illness, severe infection, major surgery and severe trauma. 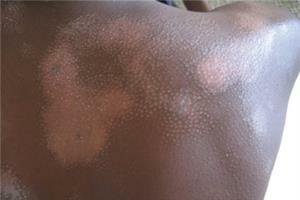 Scalp disease, including seborrhoeic dermatitis. Chronic debilitating illness, such as systemic lupus erythematosus. Change in hormone levels, for example, pregnancy. Anorexia nervosa, low protein intake and iron deficiency. Medications, including beta-blockers, anticoagulants and carbamazepine. Anagen effluvium refers to rapid hair loss due to chemotherapy, immunosuppression or radiotherapy. Within a few months of stopping therapy the hair usually returns. Trichotillomania is a behavioural disorder where people pull out their hair. It can be associated with obsessive-compulsive disorder. The hair loss is asymmetrical and has an unusual shape, and there may be broken hairs. Single or multiple areas can be affected, commonly the eyebrows and eyelashes. The management involves behavioural modification. Some inflammatory diseases cause scarring and the hair loss is irreversible as the follicle is destroyed. 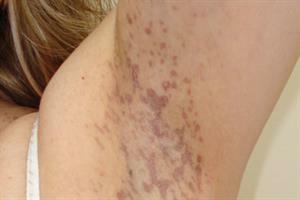 The most common causes are lichen planus and discoid lupus erythematosus (DLE). Potent topical or injected steroids are the main treatment for scarring alopecia. Antimalarials, such as hydroxychloroquine, or immunosuppressives may be given to patients with DLE, and azathioprine or retinoids may be used for patients with lichen planus. There are three stages of the hair cycle: anagen, catagen and telogen. There are different types of alopecia including: telogen effluvium, anagen effluvium, androgenetic alopecia, alopecia areata, trichotillomania and scarring alopecia. Treatment depends on the cause of the alopecia. In mild cases, only reassurance is needed. 1. Alkhalifah A, Alsantali A, Wang E, et al. J Am Acad Dermatol. 2010; 62: 177-88. 2. Garg S, Messenger A G. Semin Cutan Med Surg. 2009; 28: 15-8. 3. Mella J M, Perret M C, Manzotti M, et al. Arch Dermatol. 2010; 146: 1,141-50.